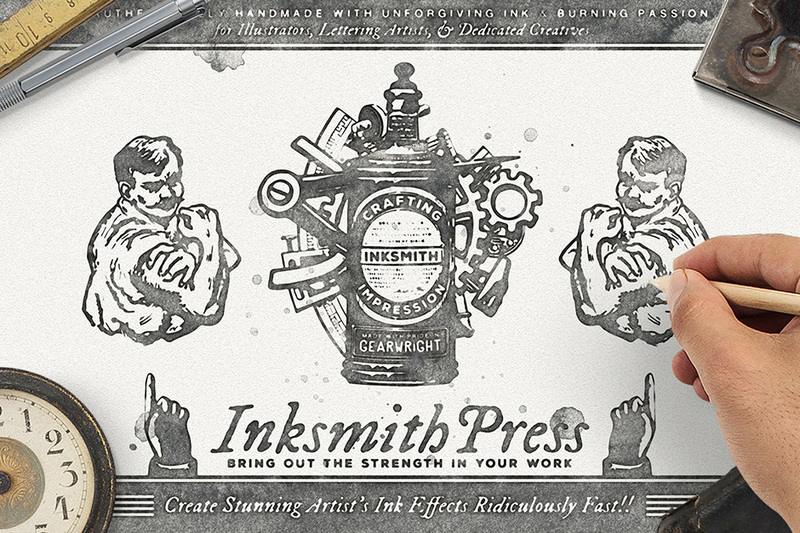 Meet Inksmith Press: A smart .PSD that transforms your work into dazzling ink illustrations with faithfully handmade textures, like an artist’s masterpiece of aged ink and paper. Inksmith will make your work speak with good old authority. • Inksmith Press .PSD (High Resolution 4500x3000px): The master file which turns your artwork into beautiful ink illustrations. Just drop your design in as a Smart Object and save, Inksmith will take care of the rest for you. • 15 carefully crafted textures from bottles of wet ink & brushes that will flow through your work with slick robustness. Readily set in the press 4500x3000px, 300PPI, activated with just a click. • 5 ink drop textures for extra realism. Again, they’re readily set in the press. Ink drops in previews were not accidental. • 3 subtle background textures (4500x3000px) for your inky business. I never forget it’s ink on paper. Check out all previews to see how good these textures look holding the ink. • Realistic rendering of your inky tones and fluidity. • Have I mentioned you can have any color of ink you desire? Inksmith will do that for you in a split second. And it will look authentic. • All inky textures were handmade and scanned and processed in the best way possible. • My texture are organic and authentic; they are of high quality, do not tile and never repeat and are always freshly made! I never duplicate or adapt textures from/ to any other products. You can sit back and relax when you buy from us.